Thunderbird gets a Twinspark makeover. I was thrilled the very first time I laid hands on a Royal Enfield, in mid 2005. In fact I was so thrilled that I virtually dragged my not so enthusiastic dad to the Royal Enfield showroom moments later (it was my 18th birthday). Why? I don’t need to answer that, right? At the time, the Thunderbird was the newest offering from Royal Enfield. And the Thunderbird’s killer cruiser look had me floored. Yes, I had seen countless modified standard Bullets, trying hard but failing to replicate the laid-back cruiser look. To my despair, my father completely ignored the Thunderbird and walked straight to the shiny black Standard instead. I had to literally sprint across the showroom to stop him from buying the Standard thumper. I called up all my persuasive powers to convince my father that the Thunderbird was the Bullet for my generation and that the Bullet had evolved enough to be sold in colours other than black. I even launched into a discourse on the left-gear-right-brake design, fuel economy, besides the modern telltale cluster and AVL engine. Was he listening? I was not sure, so I talked him into a test ride despite his even more bewildered air. The rest is history - actually I don’t remember what transpired exactly except him saying, “Why don’t you get the CBZ instead?” Nuts, I thought but I had my way and cast my firm vote for the Thunderbird. Vroom... I loved the Thunderbird at first ride because it rode like a regular motorcycle. The acceleration was excellent, the brakes were nothing to rave about but in the looks arena the ’Bird was a killer. It turned heads wherever I went and unlike my dad’s relic Standard, the ’Bird proved very reliable too; I never had to call my mother at 2am and confess that my bike had broken down. That was then. Switch to present and here I am astride a brand new Thunderbird, one sporting the Twinspark tag, and most outstandingly, abandoning the traditional separate engine and gearbox mode. This cruiser puts the Royal Enfield tradition and DNA into a modern context. The Thunderbird Twinspark is aimed at consolidating Royal Enfield’s market position and underlines the company’s realisation of the youth segment potential as consumers. There is no apparent change in chassis design as the new UCE (Unit Construction Engine) is a perfect fit for the tried and tested Bullet frame. The body panels and tank also remain the same as its predecessor’s. However, there are small but noticeable changes in some of the details. The fuel tank now fits neatly on to the chassis without any metal protrusions beneath. Weld lines are neat and uniform. The front mudguard, headlight and instrumentation clusters are the same as on the old Thunderbird. No two-tone paint scheme or garish stickers for the fuel tank nor for the side panels. The chromed pillion backrest on the one piece stepped seat, unlike the previous version, is not just a turned and twisted steel rod but is a well designed piece. There are two Twinspark badges on the side panels and a decal on the pillion backrest but there’s no mention of the UCE. The ergonomic shortcomings of the outgoing Thunderbird are mitigated somewhat with provision of foldable front footrests which help in hauling the 168kg bike on to the centre stand. To save metal and transmission losses, the chain sprocket and chain are now located on the right hand side as is the entire rear brake assembly. As a result, the left side of the bike looks plain and characterless. The UCE’s square-edged design takes some getting used to, though. The engine’s matte silver finish feels less susceptible to rust and degradation. The big 19-inch steel spoke wheels are true to the cruiser tradition and are fitted with the usual MRF crossplys. The bike feels stable at speed though vibrations are a bugbear. This Thunderbird holds its line during hard braking. 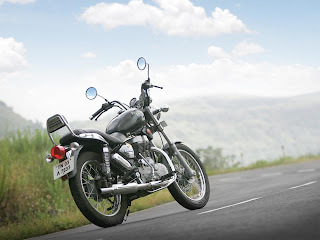 The Thunderbird Twinspark’s front disc brake and drum at the rear provide sufficient bite, the bike coming to standstill from 60kmph in just three seconds. Ride quality has never been a Bullet forte and the Thunderbird Twinspark is no exception. The wide seats and comfortable riding position ensure fatigue free riding. With its raised handlebars and front-set footpegs, this is hardly the tool for fast cornering. But the kick lever takes some muscle to prod and is (as usual) awkwardly positioned. Thank Dieu for electric start, then. The cast iron engines paved the way for the lean burn engines. As the name suggests, the new UCE integrates the engine, gearbox and clutch. The new set-up is a little more efficient thanks to the omission of a heavy drive chain. The integration of the engine and gearbox was done in-house. The engine has been tuned by European design consultants in the NVH (Noise, Vibration and Harshness) context. 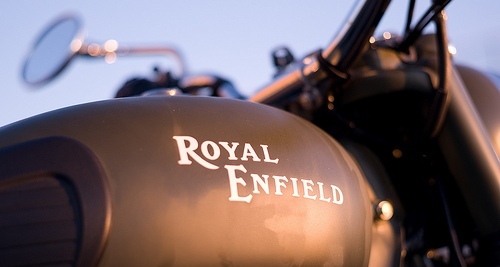 Royal Enfield calls this new engine platform the ‘engine of future growth’. With the UCE, RE aims to bump up the Thunderbird’s reliability. The valve clearance of the UCE for instance adjusts automatically through the use of hydraulically controlled pushrods and thus optimal valve timing is maintained in all situations. Another notable feature in the Twinspark is the auto decompressor which activates at 250rpm to put paid to start-up woes. The electric motor is placed on the inner side of the UCE engine to reduce characteristic sprag clutch glitches. The new UCE features superior trochoid rotary pump which pumps oil at higher pressure and ensures better cooling. This results in better efficiency and reliability. This new gen engine cranks out 19.3PS of maximum power at 5250rpm and 28Nm of peak torque at 4000rpm. The all-new 6-plate clutch requires little effort to operate. The engine offers spectacular low-end torque, but the top end feels weak. Credit is due to the five-speed transmission that ensures the Thunderbird is so useable. The engine revs up to 5500rpm without strain. The Twinspark gets to 60kmph from standstill in 5.8 seconds, nearly a second faster than the previous generation T’bird. I managed a top speed of 109kmph. I do wish the engine vibes were better controlled, though. The Thunderbird Twinspark returned 42kmpl on our combined city and highway run, and cruising at a constant 90kmph is well on its agenda. Engine noise level is similar to the AVL engined version. The Twinspark will sport the bazooka silencer which will tone down the thump considerably. But Royal Enfield will offer an aftermarket exhaust that will release the thump and make the engine noticeably smoother. The old iron block engine is still the favourite of Bullet aficionados mainly because of its thump. But superior technology and better reliability are aspects no bike maker can afford to ignore. The cruiser styled Thunderbird turned the eyes of the younger generation towards Royal Enfield bikes. The Thunderbird Twinspark is lighter and more fuel efficient than any other Royal Enfield bike. With a fuel injection engine ready to go on sale in Europe, Royal Enfield seems keen on increasing its market share. The Thunderbird Twinspark costs over a lakh of rupees however, which is definitely not within everyone’s reach. The Thunderbird Twinspark however marks Royal Enfield’s entering a more technology oriented arena. i am planning to purchase Thunderbird by next week.I need know is if i can change the thunderbird silencer with the enfield classics bend silencer as i really loved it. also if i can change the tyres of thunderbird with the 500cc classics as i find thunderbirds tyres a little too big for my liking. will it affect the balance of the bike or the ground clearence, also i am not sure it smaller tyres will look cool on the thunderbird…? please help me with your valuabe suggestion. please help me with your valuable suggestion. @nilesh both have same uce based engine...so only comparison left with us is cosmetic / bike design !! read all the reviews carefully !! conclusion : if you like cruiser go for thunderbird, if you like original enfield styling go for electra ! !